Deceased founder still startling visitors at LES house of worship. What has been deemed the “most haunted church”1 in New York City is certainly worth a visit. As the second oldest church in Manhattan, St. Mark’s Church (in the Bowery) has had plenty of time to accumulate spooky stories. Many involve encounters with the spirit of its founder, Peter Stuyvesant. According to rumors, this “peg-legged Dutchman”2 has been disrupting church services for centuries. 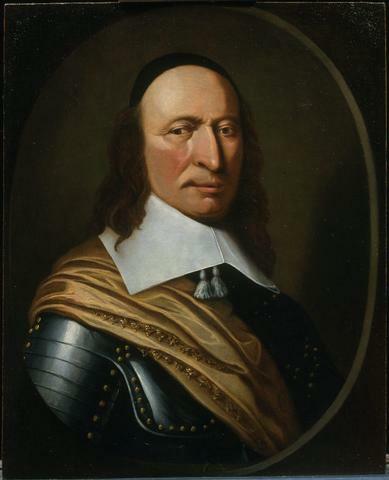 Peter Stuyvesant helped shape a lot of New York’s early history. Born in the Netherlands, he immigrated to the states in 1647, after he was picked by the Dutch West India Company to be the colony’s next director-general. Some of his most notable contributions as Governor of New Amsterdam include building the Broad Canal and the protective wall that demarks Wall Street. He is also responsible for the creation of Jersey City. Brooklyn’s Bedford-Stuyvesant neighborhood, as well as the Stuyvesant High School on Chambers Street, was named in his honor. In fact, the high school’s mascot is known as “Peg-leg Pete.” There is a bust of Stuyvesant in St. Mark’s Church (a work of Dutch sculptor Toon Depuis) and a statue of him near a cruise terminal in Philipsburg, St. Marteen. 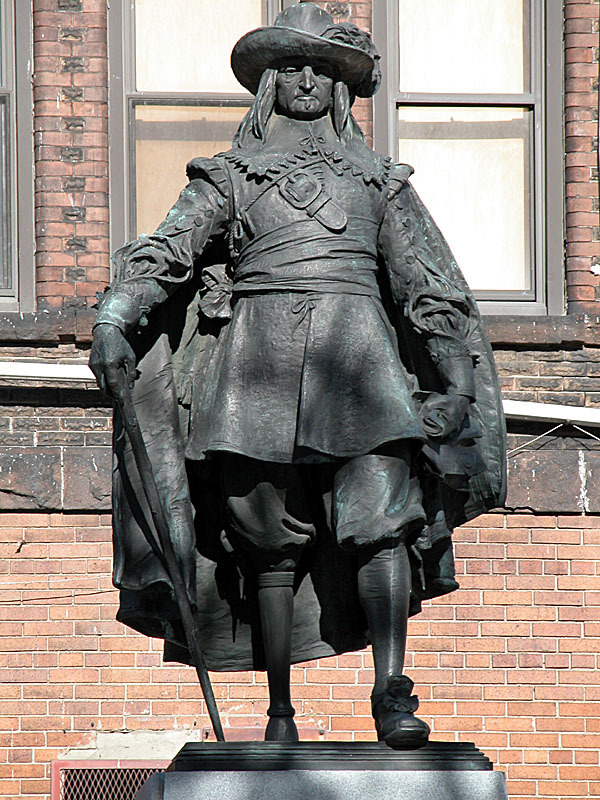 Statue of peg-legged Stuyvesant in Jersey City. Before Stuyvesant arrived in America, he lost one of his legs in Curacao. While fighting the Spanish, he was severely wounded by a canon ball and had to have the limb amputated. Relying on one leg to get around made Stuyvesant a grouchy man and a stern leader. Many people say that you can still see him stomping angrily around St. Mark’s Church with his cane. When Stuyvesant wasn’t busy running the state, he was overseeing the expansion of his sixty-two acre plantation, or “bouwerie.” His impressive property covered a few blocks of what is now East Village and Stuyvesant Town. It had a beautiful pear tree and its own family chapel. Stuyvesant himself was entombed in the chapel after he died in 1672. In 1793, this chapel was donated to the Episcopal Church by Stuyvesant’s great grand-son, Petrus. Petrus probably figured that the property would be better used serving the community – besides the family vault underneath it, little of the small structure remained. The Episcopal Church used it to lay the groundwork of St. Mark’s Church. An impressive team of architects and designers – including John McComb Jr., Martin Euclid Thompson and Ithiel Town – was hired to develop St. Mark’s. They laid the church’s first cornerstone in 1795, and the church was officially consecrated on May 9, 1799. By 1807, St. Mark’s Church had a healthy membership. Peter Stuyvesant, the most active spirit at St. Mark’s Church. About twenty years later, a lovely Greek Revival steeple was erected at St. Mark’s Church. Other architectural additions quickly followed: a weathervane and bell in 1836, a cast iron portico in 1858, a brick addition to its Parish Hall in 1861, and beautiful stained glass windows in 1885. The rectory at St. Mark’s Church was designed by American architect Ernest Flagg. It was installed in 1901. Flagg was known for favoring the Beaux-Arts style in his designs, as well as his writings on economical construction. “Colleagues said Mr. Edelman did all the design work [for St. Mark’s Church] personally”3. Today, Flagg’s rectory serves as the headquarters of many important organizations, including The Historic Districts Council and The Greenwich Village Society for Historic Preservation. The rectory was nearly destroyed by a fire in 19784. The blaze caused the church’s entire roof to collapse, resulting in the demise of its organ as well as fourteen of its twenty-three stained glass windows. So extensive was the damage that the church had to undergo a complete restoration. Funds were raised by a group called The Citizens to Save St. Mark’s. Now besides giving away the family chapel, Petrus Stuyvesant also parted with four acres of the family’s farm. He sold it to the city, which transformed the plot into the two-block, well-landscaped park known as Stuyvesant Square. Gate leading into the cemetery of St. Mark’s Church. The tombs adjoining St. Mark’s Church house many prominent New Yorkers, including Mayor Philip Hone, Governor Henry Sloughter, U.S. Vice President Daniel D. Tompkins and millionaire A.T. Stewart. Stewart was an Irish entrepreneur who made a fortune in the department store business. His “Marble Palace”6 at 280 Broadway was a shopper’s paradise – deemed the city’s first department store, it encompassed a full block and had four floors. But after his passing, Stewart’s retail empire fell apart. That did not stop a team of grave robbers from stealing his corpse7 from St. Mark’s Church in 1878, though. They held it for ransom (some reports say for $20,0008). Stewart’s poor wife, Cornelia Mitchell Clinch, decided to pay the thieves. She then moved her husband’s body to a safer location: a crypt in a Garden City cathedral. Many say that Stewart still likes to return to where he was originally interred. 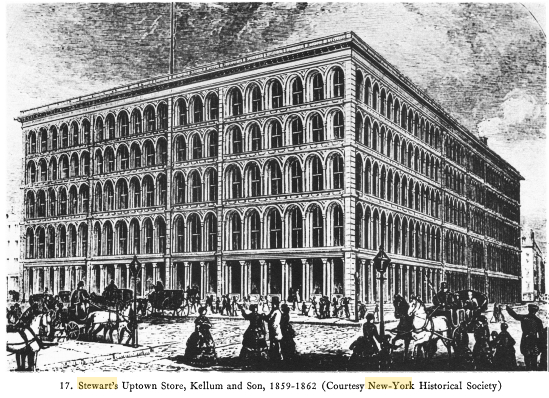 A.T. Stewart’s “Marble Palace.” Stewart’s body was stolen from St. Mark’s Church in 1878. Even if you are not in the mood for ghost hunting, the St. Mark’s Church campus is definitely worth a tour9. The church’s East Yard (on Second Avenue) features “a simplified labyrinth”10 that’s quite useful for calming a troubled mind. A park, named after Abe Lebewohl, was added in 1938 to the church’s growing grounds. Lebewohl founded New York’s celebrated 2nd Avenue Deli in 1954. The establishment has been ranked11 as one of the city’s best certified-Kosher delicatessens. Its signature matzoh-ball soup and pastrami sandwiches are hard to resist. Unfortunately, in 1996, Lebewohl was brutally murdered during a robbery in 1996, right at his beloved business. The homicide is still unsolved12. St. Mark’s Church has always been a strong supporter of the area’s artistic community. Some of its present non-profit partners13 include the New York Theater Ballet and the Poetry Project. In fact, the revolutionary punk-meets-poetry band, The Patti Smith Group, was conceived there. 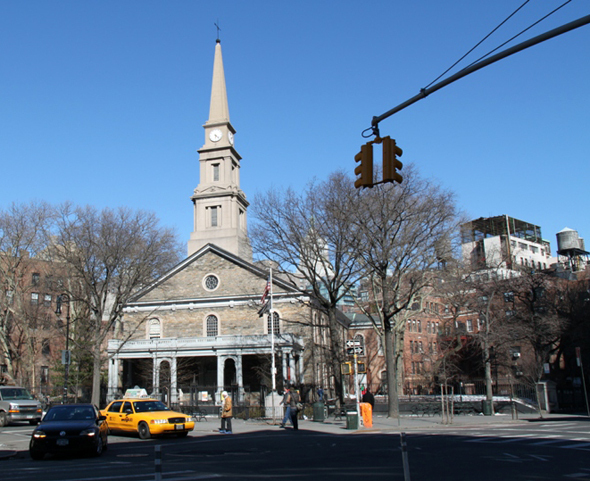 Others who have performed or started their careers at St. Mark’s Church include members of Richard Foreman’s avant-garde Ontological-Hysteric Theater, poet Kahlil Gibran, dancer Isadora Duncan, and psychedelic rock and roll band Mind Garage. 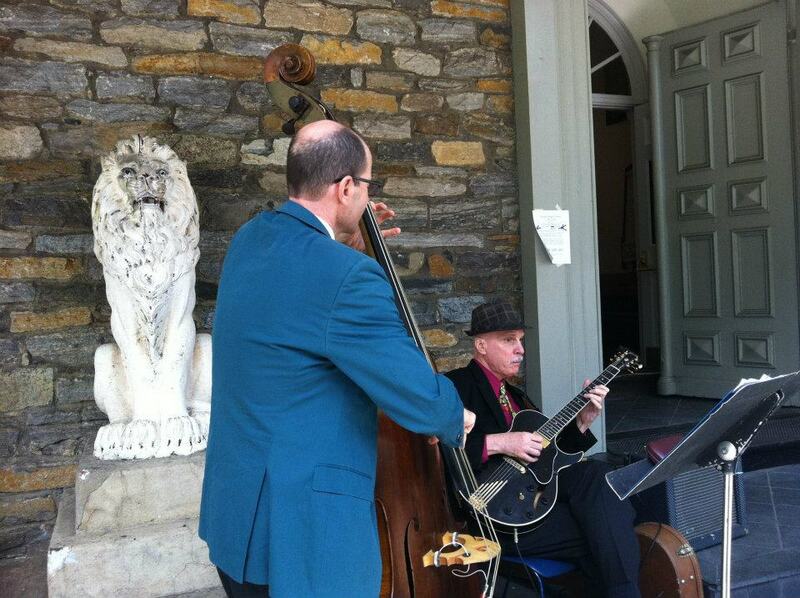 “Jazz on the portico” at St. Mark’s Church. Stuyvesant, undeniably the church’s paranormal patriarch, likes to join in on all the creativity. He is known for chiming in on hymns in his native tongue, for instance. In 193014, he was seen sitting among congregation members. When the bells at St. Mark’s Church rang on their own in 1965, people also believed it was him. Stuyvesant’s grouchy ghost is often joined by a female apparition, who enjoys greeting worshippers at St. Mark’s rear entrance and even joining them in prayer. She is also frequently seen standing on the church’s balcony, wearing a wide skirt. Foreman Cole, hired by the church to wind its clock, claims to have seen her15 multiple times. There are certainly a lot of spooky things you will hear and see at St. Mark’s Church. Perhaps you will hear Stuyvesant’s distinctive peg-legged steps, or a few notes from his off-key warbling. Maybe you will spot the dead female church-goer, mingling among the living, or the poor ghost of Lebewohl, still looking for his killer! Fishbein, Rebecca. “The 14 Best Haunted Places in NYC.” Gothamist.com. 29 October 2015. Web. 6 February 2016. Para. 16. Amato, Rowley. 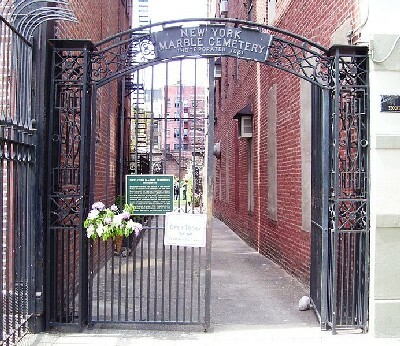 “The 13 Most Haunted Buildings in New York.” NY.curbed.com. 31 October 2013. Web. 6 February 2016. No. 7. Sullivan, John. “Harold Edelman, 75, Architect Who Helped to Save Small Treasures for New York.” The New York Times. 5 January 1999. Web. 6 February 2016. Para. 4. Soter, Tom. “Bowery Church Fire.” Newspapers 1970-1979. Tomsoter.com. Taken from The Eastside Express, 24 August 1978. Web. 6 February 2016. “New York Marble Cemetery.” Marblecemetery.org, n.d. Web. 6 February 2016. Para. 1. “A.T. Stewart Store.” National Register of Historic Places Inventory – Nomination Form. US Department of the Interior National Park Service. PDF upload. focus.nps.gov, 2013. Web. 6 February 2016. Page 1. Barnes, Larry E. “Cornelia Mitchell Clinch Stewart.” FindaGrave.com. Record added April 14, 2014. Web. 6 February 2016. Para. 4. “Why did thieves dig up this New Yorker’s corpse?” Ephemeral New York. 2 April 2014. Web. 6 February 2016. Para. 7. NYCulture, courtesy of the St. Mark’s Historic Landmark Fund. 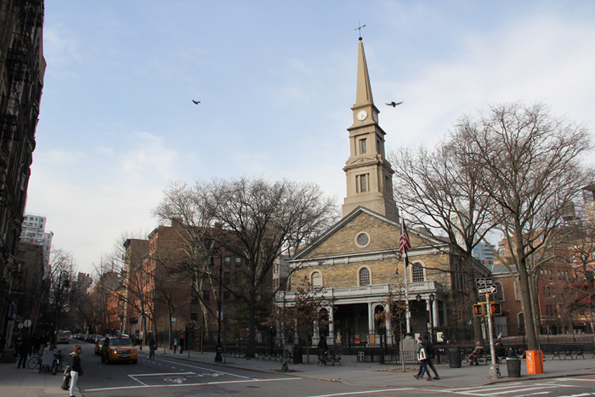 “Self-Guided Walking Tour of St. Mark’s Church-in-the-Bowery.” www.smhlf.org. November 2007. Web. 6 February 2016. “Labyrinth.” St. Mark’s in-the-Bowery, n.d. Web. 6 February 2016. “Top 5 Delis.” NYmag.com. 8 June 2010. Web. 6 February 2016. Para. 3. Tanner, Jeremy and Mary Murphy. “Still no justice for Holocuast survivor and deli king killed in Manhattan.” Pix11.com. Updated 18 July 2014. Web. 6 February 2016. “Art Partners.” St. Mark’s in-the-Bowery, n.d. Web. 6 February 2016. Gatti, Shel. “The Paranormal at Home: Hauntings in 50 States – New York’s St. Mark’s Church-in-theBowery.” Fringe Paranormal. 26 October 2013. Web. 6 February 2016. The Lineup. “THE GHOSTS OF ST. MARK’S CHURCH IN-THE-BOWERY.” Excerpt from This House is Haunted: True Encounters with the World Beyond by Hans Holzer. The Lineup, no date. Web. 6 February 2016.